Pakistan flood victims on the road Jump to media player The main north-south motorway into flood-hit north-west Pakistan partially reopened on Sunday to help get aid into the region. The main north-south motorway into flood-hit north-west Pakistan partially reopened on Sunday to help get aid into the region. Many used the opportunity to leave the area, causing massive traffic jams. 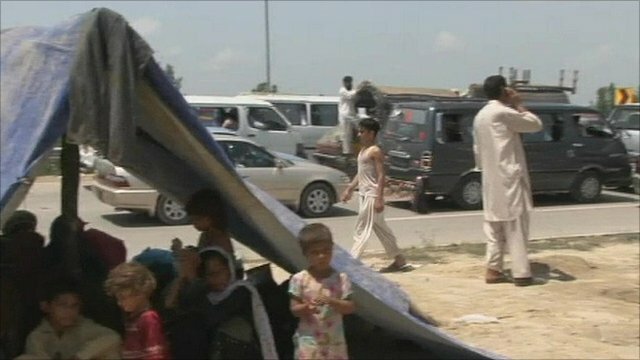 Displaced people are camping by the side of the road under whatever shelter they can find, as one man told the BBC's Lyse Doucet.